Our pastor preached from 1 Peter 3:15 – 16 today. He was wrapping up a series on key values of the church. Capturing the key words in the sermon today speaks volumes! 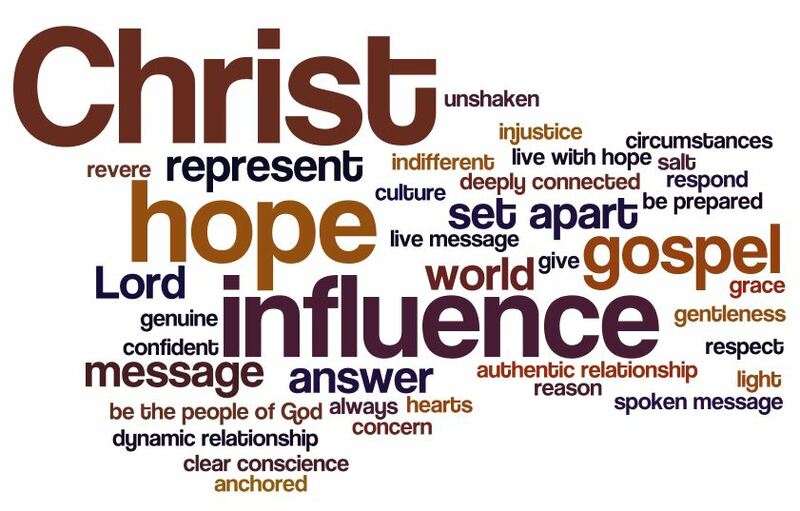 How do Christians influence an indifferent culture? Develop a dynamic relationship with the living Christ through Bible study, prayer, and fellowship with believers. Demonstrate confidence in God’s care; we are unshaken, anchored, held by His right hand. Be ready to explain simply the reason for hope. Live and speak with gentleness and respect. I dare not trust the sweetest frame, but wholly trust in Jesus’ Name. This entry was posted in Reflection, Sermon Notes and tagged confidence, gospel, hope, influence. Bookmark the permalink.